First, I start off with "d3". You don't have to instantiate (create) d3 or anything, you just have to include the d3 script in your page and it will work. Then, from d3, I select the body of the page. Simple enough - just make sure you wrap what you're selecting in quotes or it won't work. Update - this is automatic, e.g. you don't write "data([1, 2, 3]).update()" - it doesn't exist, because it doesn't need to. Right now, we're just going to use enter. You should perform tasks after enter whenever new data is being added. You would use update to update existing data (e.g. when a value changes), and you would use exit when data is being removed. No, not really. :/ If we just wanted to display text, we would use plain HTML! We want to make graphs, so let's do it! If your SVG code has a spelling error or you're missing a fundamental attribute (such as setting the width of a rectangle), it won't work. You have to use D3 properly. 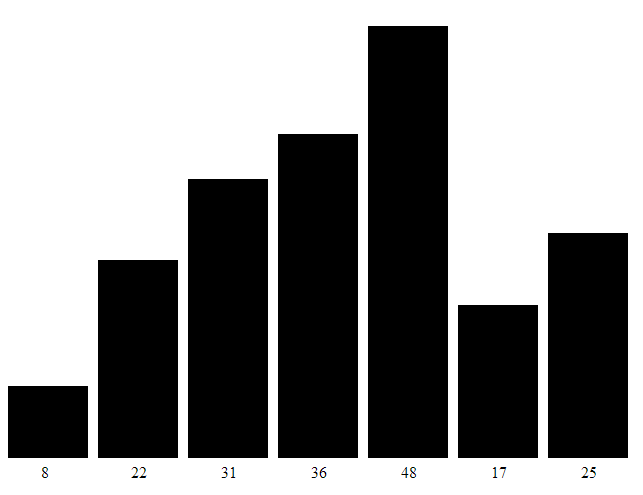 Okay, so this bar graph is a lot prettier than what we had before! It could use some improvements, but it gets the job done: with not too much code, it displays our data as a graph using D3 and SVG. Once the window has loaded, I select the body of the page and append "svg" onto it (which is what tells the browser that we're using SVG, basically). I also set the width and height properties of "svg" to "100%", meaning that our SVG graph should take up the entire page. Note: this does not mean that we specifically have to draw something on the entire page - it only means that we can. If your width and height are not set (in my browser they default to a few hundred pixels or so in both dimensions) or they are set too small, your graph may end up being cut off! I then have it select all "rect" elements. Notice that as of now there aren't any! Basically, you're supposed to tell D3 that you're going to want to have rectangles. I believe they do this for the enter, update, and exit functionality, if I'm not mistaken. Then I add some bogus data and call the "enter" function. Notice how I store the result of "enter" in the new "dataEnter" variable. This is primarily because I will be using "enter" twice later on. Then I do some math and variable setup... Feel free to read through that section, read the comments, try to figure out what I did and why I did it, etc. Basically, you can customize a few simple aspects of the bar graph without having to read through any intense code. It also makes the code more efficient and easier to read when you make it like I did. Alright, this is where it gets interesting! Now we're actually drawing the graph (the bars and the text) based off of the D3 setup of SVG, the "enter" function (stored in "dataEnter"), and the math and variables from earlier. This code should be relatively self explanatory (for the most part), so I'll go through it briefly and explain some of the not-so-well-known details along the way. Just to make sure I wasn't misinforming you, I tried making the code like this (with the text part commented out) and the bars displayed the same as before. I declared an anonymous function (also called a "lambda function" sometimes) as the second parameter of the "attr" (attribute) for "x" (the X position of the rectangle). I also told it that there are two parameters, "d" and "i", that will need to be passed to the function. If you look at the function for "y" (the Y position of the rectangle), however, you'll see that I only told it to use one parameter, "d". but this would give the same X position (5) to every rectangle - we don't want that! :) So instead, we use a function, which allows us to set the X position of every rectangle based off of the data value (stored in "d") and/or the index of each piece of data (stored in "i"). This was the data array that I used: [8, 22, 31, 36, 48, 17, 25]. This means that for the first piece of data, "d" will equal "8", then for the second, "d" will equal "22", etc. So what is the index, then? It's the position in the array. For the first piece of data, "i" will equal "0". You might be wondering why it would equal "0" and not "1" - the reason is that in almost every programming language in use nowadays, arrays start counting at 0 rather than 1. So the first element in the array will be "0", the second will be "1", etc. - the same goes for the value of "i". However, for the Y position, I only needed the value of each piece of data. Every rectangle in SVG is positioned by its top (Y) left (X) corner, regardless of its width and height. In case you don't know, the coordinates (0, 0) are the top left of the page - this is standard for computer graphics. Then finally I sized each bar (with the "width" and "height" attributes), added some text (with the text's contents being the value of each piece of data), and positioned the text. Very clear. I enjoyed reading it. I've been looking at this page for two days...I'm wondering, how can you read data from a text file (with no commas..) and input it as the data to create these graphs? Also, if you wanted to add animation to your graphs, would you place the commands for animation after the section you "draw bars"? Right now, my buyer is having me make a tutorial using the CSV (Comma Separated Values) file format (commonly used in spreadsheets). D3 actually has some functions to make this task very easy with CSV files. Wait a couple of days or so and I should have this tutorial finished. More details with more accuracy should come at a later time. AWESOME thank u!!! I'll check it out! Yeah, I've used all 3 before as well. Yes, it will end. Do you want to know why? When I found out that SVG graphics are essentially "addition-only", it ended for me. What I mean by this is that you either have to clear the entire canvas or you have to erase over top of individual elements manually - there's no "automatic erase/delete" like there is in the "real" programming languages. I think I mis-understand "automatic erase/delete". Are you referring to e.g. Java's memory clean up when objects/variables are no longer being referenced? Ahh, so Raphael has a Remove function. I remember not liking some limitation about Raphael before, although it's been too long since I've used it. Thanks! It is very helpful to try D3. Thanks! I'm glad I could help. Great job Andrew! Thanks for explaining it piece by piece. I like how your writing is in ACTUAL ENGLISH, rather than some professor speak IT nerd bs. I understood it, as did my cat. Cheers. In the first portion, you selected the wrong element. Tripped me up for a bit, since I'm such a newbie at this haha. Couldn't get the first element to print when I tried it with the latter version. Thanks for the tutorial! The code that I wrote worked perfectly for the scenario that I had presented and the version of D3 that I had used. You can check the source code in the example page and verify this. So you're either not matched to my scenario or my version of D3 at the time that I had created this tutorial, and it seems here like it would probably be the former case. It may also depend on the browser/version you are using as well.